You can make better choices for your tiny house that will save you time and money in research and mistakes, even if you’ve never built anything before. I’d like to share with all of you a couple of great resources brought to you by an experienced tiny houser, Ethan Waldman. 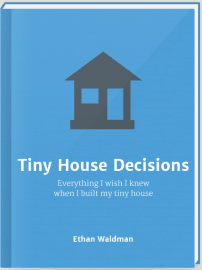 First off, he’s got a free PDF resource called “Before You Build: 30 Questions You Must Ask While Planning Your Tiny House.” This is absolutely FREE and offers a great starting point to get yourself asking the right questions — AND coming up with the right answers to really start taking your tiny house journey seriously. Feel confident about the choices you’re making – because you’ll know they are the right decisions for you. I love how this book covers a wide range of topics and important decisions and it does so with priceless real world examples. Everything shared here has been learned the hard way by others. Save yourself the headache and short-cut all your potential mistakes and hard lessons by starting with this book! Editor’s Note: This blog post contains affiliate links. I have personally reviewed all the products listed here and am sharing them because I believe they are very high quality and are excellent resources for the potential tiny house builder. Enjoy! Hey Alek! I sincerely appreciate the mention here. It means so much to have the endorsement of other tiny house authorities, such as yourself! Ethan; a short time ago you offer free download of tiny house decision, we thought we downloaded it but it seam that we didn’t, would it be possible for you to send it to me buy e-mail. Hi Charlie, The free download I have been offering is the “30 Questions you must ask while planning your tiny house”. If you signed up to receive it, please check your spam folder as sometimes the confirmation email winds up there. If you can’t find it, please send me an email: ethan[at]thetinyhouse.net and I can find it for you. Thanks!